Micro-blogging sensation Twitter is rarely out of the news these days, but this week's rumours that it was to be bought by Apple has meant that everyone has been 'tweeting' about the future of the site. It turns out that the website is not for sale, however, according to co-founder Biz Stone. Speaking on US talk show The View, when Stone was asked about the Apple buyout he replied "no", explaining: "We're just getting started. The company is two years old, we have so much to do, so much product stuff to fix, and so much growing to do." Twitter is the latest internet sensation to see substantial growth in the last year. It's not just that the website is hitting around 7 million unique users a month, it is how quickly it has happened. Nielson Online is quoting a 1,382 per cent rise since February 2008, and in America the site's popularity is rising by 50 per cent month on month. Apple isn't the first to be linked with a buyout of the site. 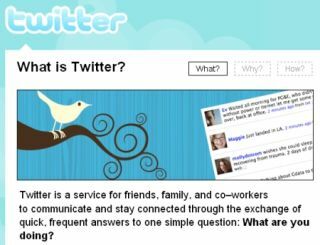 Facebook offered $500 million for Twitter at the end of 2008 but talks ended in stalemate.